Here’s a free printable invitation for Shopkins addict for your birthday party. This bunch of little Shopkins like cupcake, sandwich, tomato sauce, pop corn and other cute favorite. You can download this invitation for free. If you want to keep it, and wasn’t able to operate Photoshop or Coreldraw, or not too tech savvy, then you simply choose this invitation. It comes in JPEG format and it’s ready to print. It’s super simple to use. 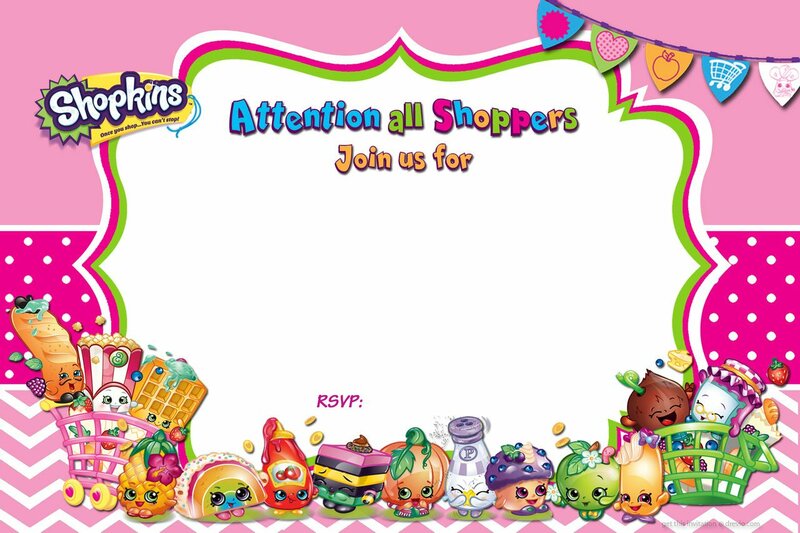 Just download this Shopkins invitation template, print it out, grab a pen and write your party details like time, date and location. You can use colored markers too and write your party info in creative ways. It measures 5×7″ inches with full HD resolution. How to Download this FREE Shopkins Invitation? It’s super simple! Simply click on the image and download the invitation. As simple as that. Then print it out. If you are able to operate Photoshop, then you can customize it in any way! You can attach your own photo, add some glittery text, etc. If you need official Shopkins font, you can download Shopkins font ttf and install it. Some Shopkins Invitation Wording Ideas. We have some examples for your Shopkins Wording Invitation ideas. You can use it , or simply modify the wording. It’s free to use. ONCE YOU SHOP, YOU CAN’T STOP!